The Intra Europe volumes are combined with feeder volumes from around the world into a ?multi trade service?, the EUROMED. Maersk Line will offer a reliable coverage of ports in this trade through a single and effective product. On the northbound sailing, the service will cover Alexandria (Egypt) and Ashdod (Israel) and thus bring a unique and innovative solution to this important reefer market. The Euromed service will cater for the combined reefer flows from South America, North America, as well as intra Europe flows into one single rotation. The new service optimises the existing networks and deploys four vessels of each 2.200 TEU, which allows for efficiency through size and ability to operate at an economical speed. The EUROMED will phase in at Ashdod (Israel) on 5 January 2009, with the Maersk Buton, voyage 0904. Maersk Line will offer its customers a comprehensive and consistent coverage through a single and effective product. The new schedule will ensure an increased reliability by having a direct service between North Europe and the Eastern Mediterranean and back to North Europe, which will accommodate our customers" needs during the reefer season. The rotation will be as follows: Bremerhaven (Germany), Tangier (Morocco) - Gioia Tauro (Italy), Alexandria (Egypt), Ashdod (Israel), Valencia (Spain), Felixstowe (UK), Rotterdam (Netherlands), and Bremerhaven (Germany). 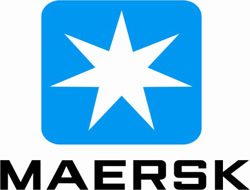 The sailing schedule including route maps will be available on maerskline.com. More detailed vessel information and voyage numbers will be advised in due time.